There are not one, not two, but three 'weapons' on the "nuclear option" menu for Saudi Arabia to strike back at any US sanctions stemming from its alleged murder and dismemberment of dissident journalist Jamal Khashoggi in what is now being reported as a "botched interrogation." The first is simple and well known - "oil" - cutting off its own supply "nose" to send prices to $100, $200, or $400 may end up spiting its own face however. So let's take a look at some other options. President Trump has so far stated his unwillingness to impose any kind of punishment on Saudi Arabia, and as Statista's Martin Armstrong notes, this could be why - the U.S. is the world's biggest exporter of arms and according to data from the Stockholm International Peace Research Institute, the biggest importer from the country in 2017 was Saudi Arabia. This infographic uses the Stockholm International Peace Research Institute's "trend-indicator values" (TIV). These are based on the known unit production costs of weapons and represent the transfer of military resources rather than the financial value of the transfer. As Trump himself warned, there are plenty more "sellers" of deadly weapons in the world. However, there is a third - potentially most existentially challenging option that the Saudis could unleash would be 'dumping its Treasury Holdings'. 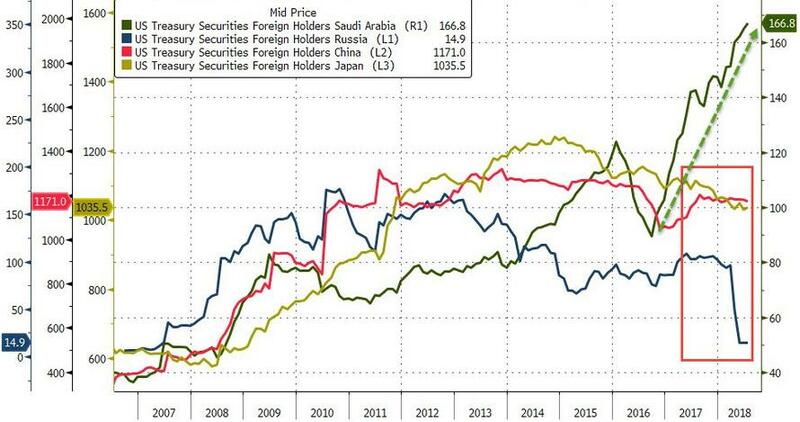 Notably, in the last two years, they have been a notable outlier with Russia, China, and Japan all selling down (or completely dumping) their Treasury holdings. 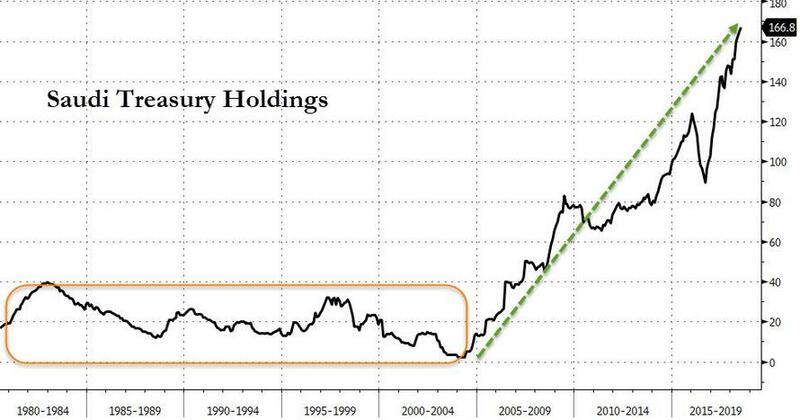 So - could the Saudis unwind their Treasury book? Or even stop recycling those petrodollars anytime soon? The answer is yes, especially given the impacts that tyrannical hegemonic actions of Washington in recent years have had on the rest of the world, increasingly pushing them all away from the dollar-centric world payments systems.